Bronze fountain of a boy flutist by Sylvia Shaw Judson Hawkins. Famous artist from the Chicago area who has created the bronze which is on the cover of the book Midnight in the Garden of Good and Evil. Fountain is signed SSJ. This is the top of a fountain. Their is a tiny hole in the tray where the water comes out into the pan and then overflows onto the lip of the pan. Two pair available, price is for each pair, circa 1910 sconces which have been rewired. Bronze with Wedgewood style cameos. Pair of tall patinated bronze table lamps. Fine castings of animals and Japanese symbols. Single socket with glass diffuser. Shades not included. Height is to the top of shade, 35.5in. 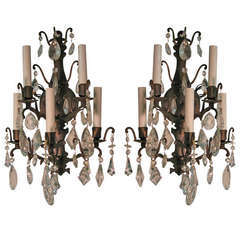 Elegant Pair Of Sconces With Seven Different Shapes Of Prisms. Created Out Of Bronze With Five Lights On Each Sconce To Illuminate.